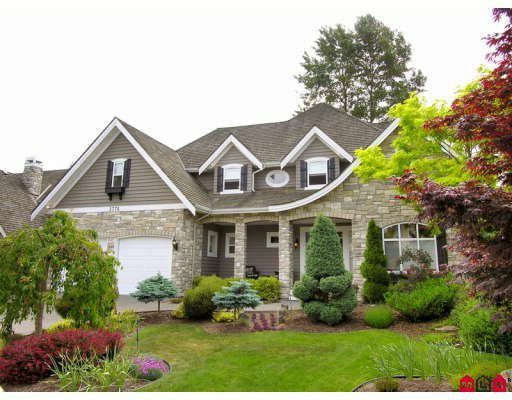 Elegant contemporary executive home on the 'Signature Hole' 13th Fairway at Morgan Creek. Great room plan with open gourmet cooks kitchen, finished with top quality hardwood floors, maple cabinets, granite counters and stainless steel appliances. Other finishing touches include crown moldings throughout, Hunter Douglas 'Silhouette' blinds, extensive pot lights and 4 fireplaces. Off the Great room/kitchen is a large covered slate deck overlooking the gardens and golf course. The formal dining room is graced with sculpted ceiling and crown moulds. Front living room has built-in cabinets, fireplaces and french doors. The master suite is a private hide-away with its own fireplace, separate soaker tub and shower, huge vanity with double sinks, walk-in closet and coffee patio overlooking the golf course and mountains. Downstairs are fully finished family and recreation room with wet bar, cabinets and counters and exit to private patio.